How much do I listen to Spotify? The objective answer to that question requires some math. How many minutes are there in a year? There are 365 days in the year, with 24 hours in each with 60 minutes in each of those hours. Without considering leap days and other obscuria, there are 525,600 minutes in a year. 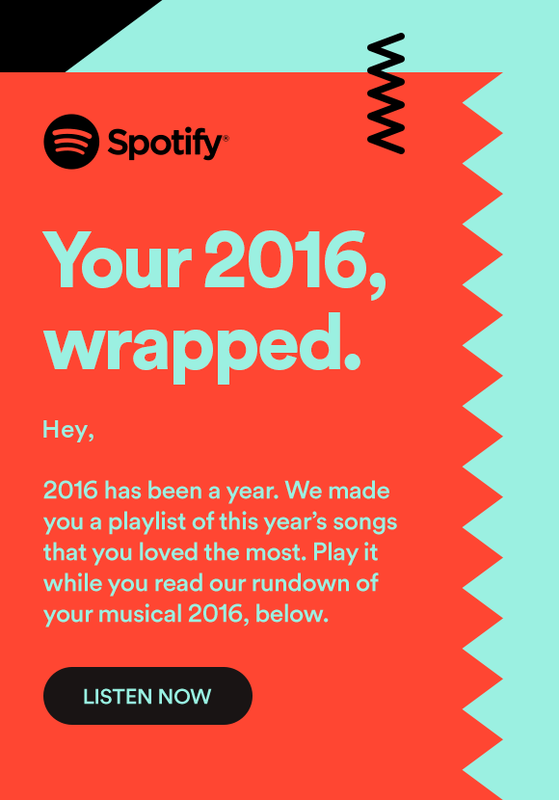 Spotify is telling me I spent nearly 10% of 2016 consuming their service. 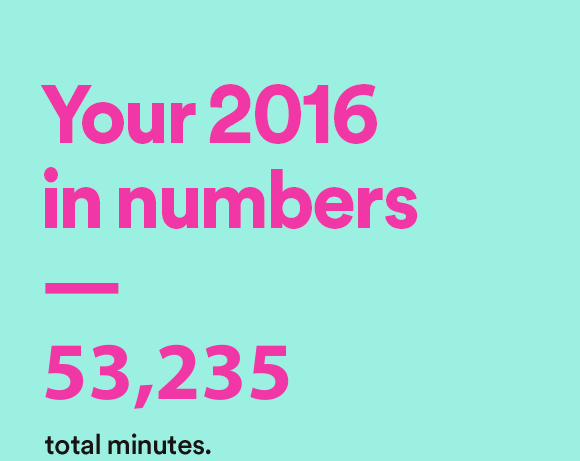 Specifically, the service reports I spend 53,235 minutes this year. I enjoy the curated playlists, and I have a few to which I keep coming back. I have the kind of job where I’m either in a meeting or sitting at my desk. When I’m at my desk, I commonly have Spotify on. It’s not surprising then to know that most of my time on the service occurs during the week. I won’t tell you how much I spend annually on online services. It’s embarrassing and worse you’d tell my wife, and she would be angry with me. But I will say I pay for a handful of services, some of which cost more than $100/year. I guarantee none of those other services will ever tell me how many minutes (or transactions or any other metric) I consume from their service. They won’t tell me because they want to continue to receive my money and I would probably stop doing so if I ever learned how little value I get for them. I pay $15/month or $180/year. I’m sure you can see where I’m going. I spend approximately .3 cents/minute. Read that closely. That’s 3/10 of one cent. But wait you say, the $15/month rate is for the family service. Why are you paying that much? My family all use the service. I doubt any of them use as many minutes as I do, but that per minute spend rate is only going to go down as I add my families minutes to the equation. Let’s put that rate in context with the alternative approaches to consuming music – chiefly radio and purchasing the songs directly. According to Spotify, this year I listened to 2,543 individual tracks from 2,392 unique artists. iTunes sells most songs for 99 cents with more popular songs going selling for as much as $1.29. None of the songs I listen to are popular in a contemporary sense, so I’ll just use the smaller amount. That math is easy. 2,543 songs would have cost me $2,517. The math for the radio is much harder and requires many more assumptions. I don’t pay for radio (assuming you don’t count the cost of the radio in my car or on my desk). First, I would have to find some combination of local radio stations which play my preferred music. Assuming that’s the case, I would then need to factor in the number of minutes of advertisements I would need to add to the total time it would take to cover the songs to which I listen. I’ll assume that in any given hour on the radio that fifteen minutes are consumed with ads and on-air personality radio chatter. Now, I’m listening to the radio for 66,543 minutes to hear all 2,543 of those songs. My time is worth something, even if that’s not always apparent from the ways in which I choose to spend it. Let’s make the math easy and say an hour of my time is worth only $10. The additional 220 hours I spend listening to ads would then cost me $2,200.